Meekyoung Shin – Written in Soap Cavendish Square 2012-? Are the ruins of art sometimes more beautiful than the art when it was new? If we think so, is it just us nowadays that think this? And is there a way that the elusive beauty of ageing can be harnessed when making new work? Some folk like new art, some like old art. But for those of us that like both, there are some interesting pathways between them. 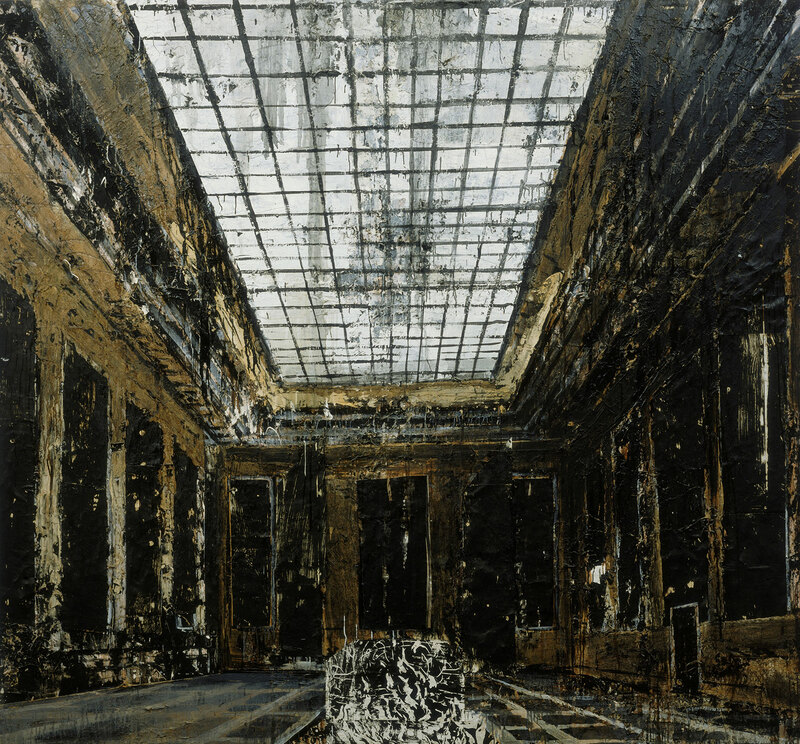 Kiefer clearly sensed the change that comes over architecture when it becomes ruined. Imagining the ruins of a thousand year reich that could have been gave him some of the strongest images that he has produced. These paintings access the part of our consciousness that appreciates the beauty of ruins even though they may be the carcass of a long dead tyranny. We are awed by might, and the passage of time removes any guilt at its origins when we admire its works. 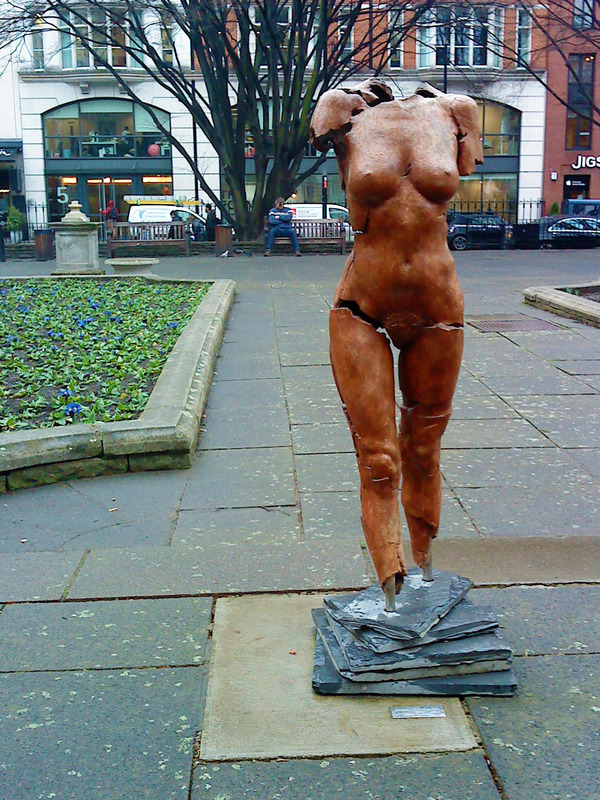 Josie Spencer’s sculptures in Golden Square are built to resemble cracked and damaged statues. But they are neither – they are whole and new and as the artist conceived them. 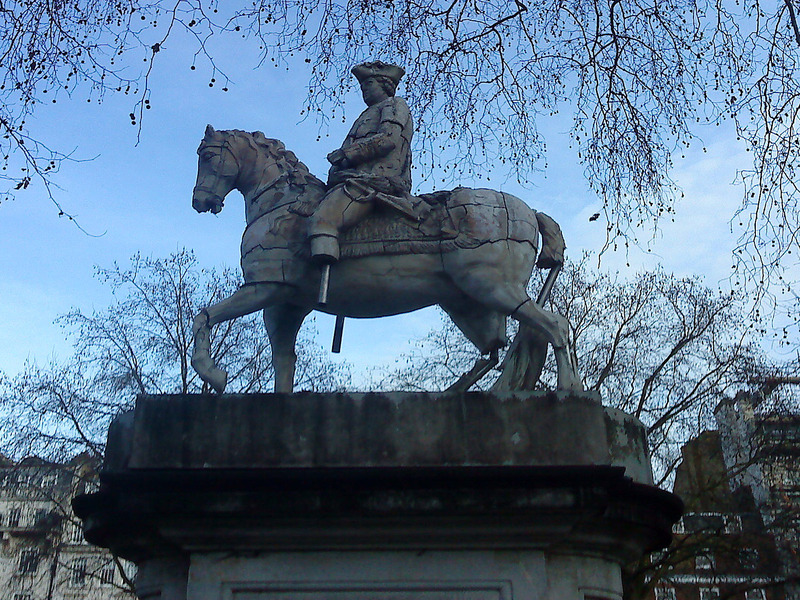 Somehow they still look new though – next to the whole and only slightly eroded statue of George II which the pigeons seem to prefer. Somehow their choice of subject and presentation marks them out. But they do raise the question of completeness which arises when you see a fragment or something pretending to be a fragment of work from the distant past. In Cavendish Square there is another sculpture with a rather more oblique and interesting take on the processes of decay and ruination. Korean artitst Meekyoung Shin’s Written in Soap is a straight version of a marble equestrian statue, but made in soap. It has been there since 2012, originally scheduled as a one year project it is still there today. The erosion of detail being slower than I expected but still helping us reflect on the changing meanings of sculpture as it becomes historical. 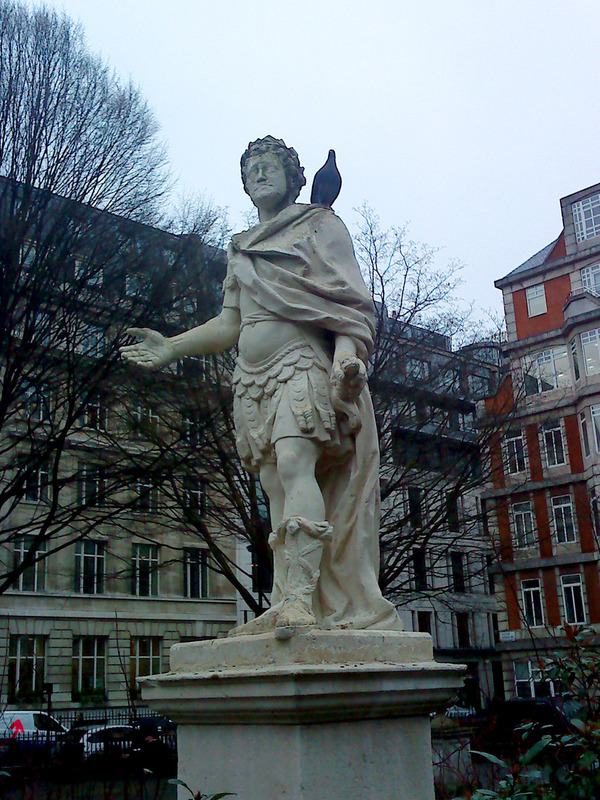 Interestingly, the pigeons don’t seem so fond of this one. Meekyoung Shin’s Written in Soap in 2015. Ruins and fragments can be beautiful. They can evoke the distant times and places better than any exact reconstruction. Maybe not entirely accurately, but very vividly. 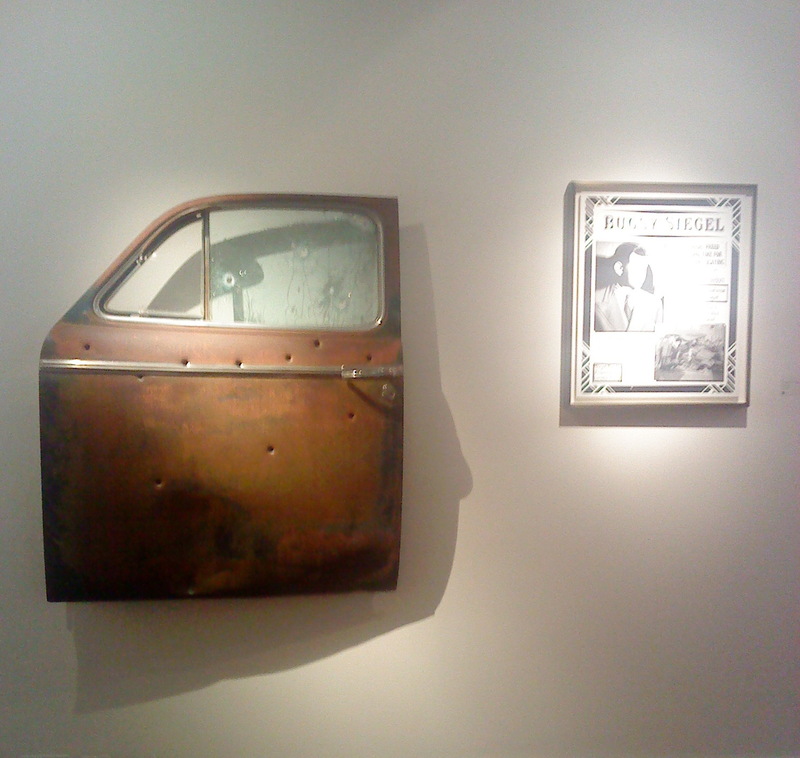 In Bob Dylan’s strange exhibition at the Halcyon gallery he exhibited old car doors with bullet holes alongside the biographies of various old-time gangsters. No-one understands myth making better than Bob and he used these manufactured fragments to convey them because they are so potent. Dylan. Someone has been more than knock knock knocking on this door. Some ruins beautiful to us do not look as they once did. Maybe we wouldn’t like them as they originally were – painted Greek temple sculpture for example. But we don’t care; if we have the artefact it is somehow more authentic than if a contemporary artist was to remake that work exactly as it originally was. Time is the greatest artist – it can reduce the monumental to rubble but enhance a humble domestic object with patina. 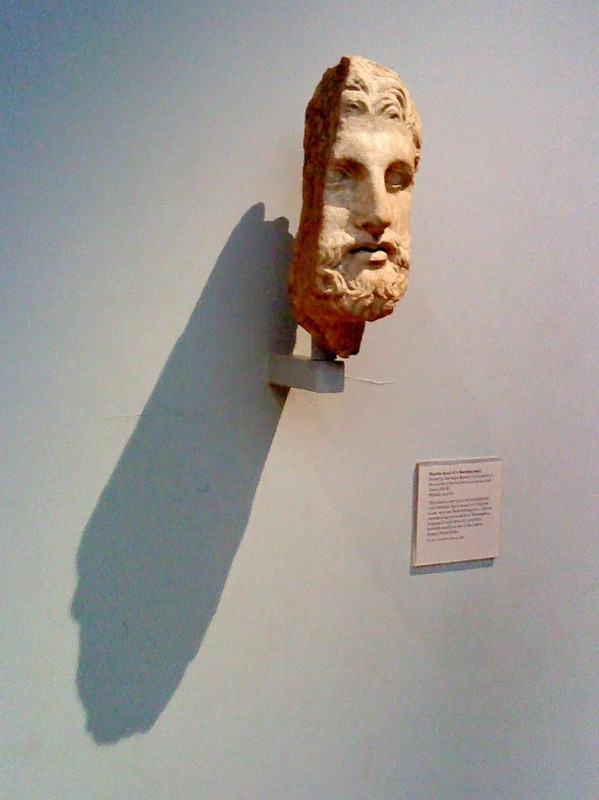 This ruined head at the top of this post struck me when I went to the British Museum recently. I loved the damage which seemed to be so integral to it, and made it so much more poignant than if it had been part of an undamaged whole. Its original meaning was only a shadow. Sometimes you look at a broken fragment but if it is beautiful you can see it as a whole thing. You forget it was ever part of something else. There is an instant when you decide how to see it. If you are very quick you can just about catch your brain at it. You can either see the object as it is – the physical arrangement of matter – and take it as an independent fact. Or you can see it as a fragment of a larger whole – a broken piece, a body of work, the culture of a civilisation or a century. 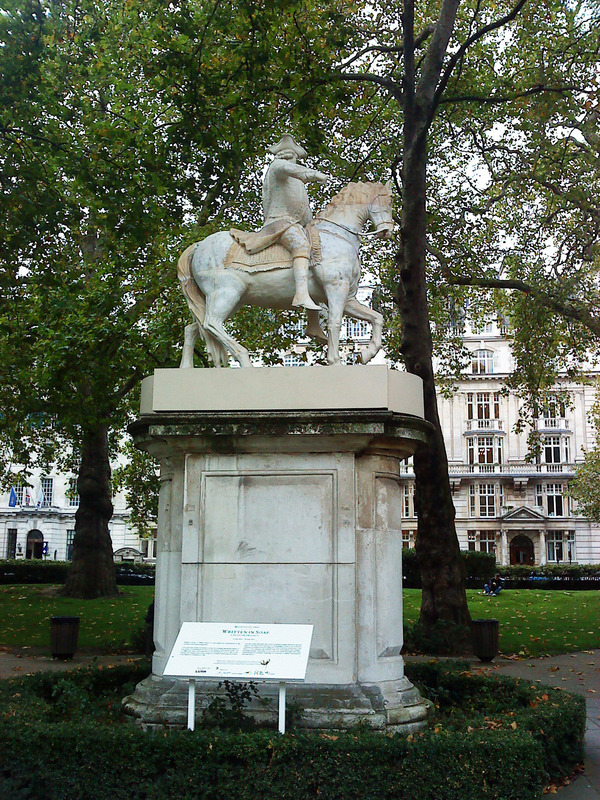 This entry was posted in Art, London, Sculpture and tagged Art, Bob Dylan, Cavendish Square, Galleries, Golden square, Kiefer, London, Sculpture.